Oct.7 “flip the switch” ceremony will commemorate completion of latest sustainability project at the U. The University of Utah will officially “flip the switch” to unveil a new solar parking canopy in the southwest corner of campus designed to save energy and serve as part of a broader sustainability plan. A short explanation of the solar canopy project will take place at 10 a.m. on Friday, Oct.7, at the structure, which is near 383 S. University Street. A symbolic “flipping of the switch” will follow brief remarks. 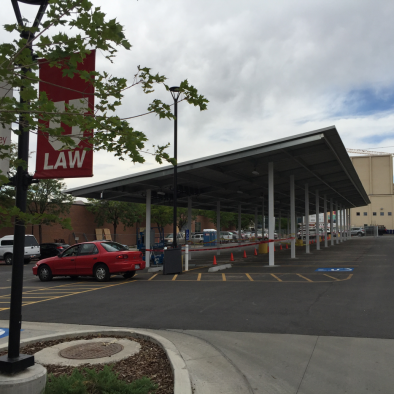 The new solar canopy covers about 40 parking spaces and will provide 100 kilowatts of power. The project was funded by theS.J. Quinney College of Law, the Alternative Visions Fund of the Chicago Community Trust and the Sustainable Campus Initiative Fund. The project is the result of a joint partnership between the U’s law school, Sustainability Office, Facilities Managementand Commuter Services. “This pilot project has the potential to help create the organizational structure needed to significantly expand solar on campus, while adding no additional costs or fees to students. 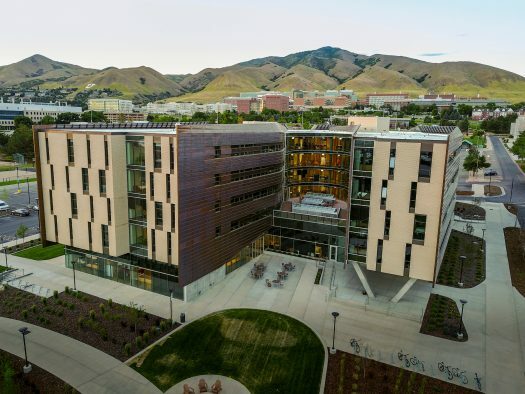 By bringing together these amazing donors, academic leadership from the College of Law, Commuter Services and Facilities Management, we are able to help the campus transition toward clean and renewable power,” said Myron Willson, deputy chief sustainability officer at the University of Utah. The idea for the canopy started several years ago, after a report by MBA students working with the Sustainability Office and Commuter Services in 2010 found that adding solar panel shade structures in campus parking lots would provide significant energy cost savings over time. The canopy will produce approximately 132,000 kilowatt hours of clean electricity per year, according to Bill Burgoyne of Solar Fulfillment, a contractor who worked with the U to implement the project on campus. That amount of electricity is equal to the amount used to power an average of 14 average homes per year and is projected to save the U about $10,600 in annual power costs, Burgoyne said. 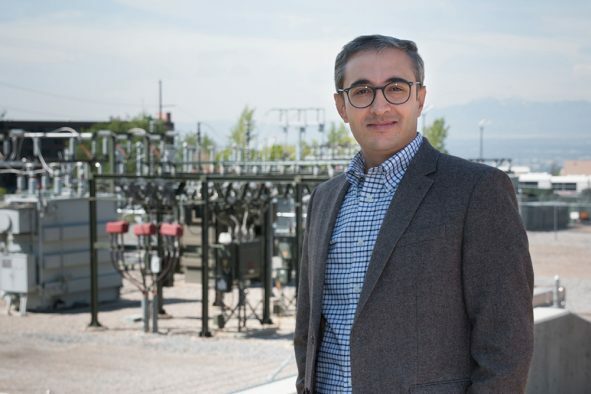 “The project will assist the University of Utah to work toward a goal of generating 20 percent of its power from renewable energy by 2025,” said Burgoyne. “Solar carports are becoming more popular across the country due to multiple benefits,” he added. Robert Adler, dean of the S.J. Quinney College of Law, noted the law school’s contribution to the project came about as a result of a donation from the Alternative Visions Fund of the Chicago Community Trust, which provided a $4 million donation to fund sustainability features in the newly constructed law school building and a $500,000 challenge gift to encourage others to give to building green fund. The donation allowed the law school — which celebrated its first anniversary Sept. 1 by announcing it received a LEED platinum designation — to include smart structural design in its construction, resulting in the facility achieving a greater than 50 percent reduction in energy costs beyond code requirements. 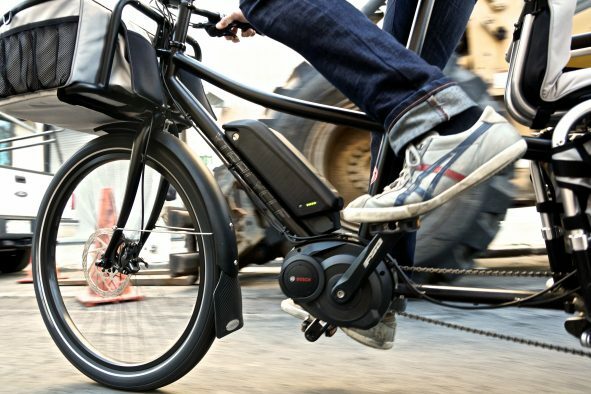 Other sustainability features made possible through the donation included smart lighting systems, maximum use of natural light, window technology that reduces bird collisions and electric car charging stations. 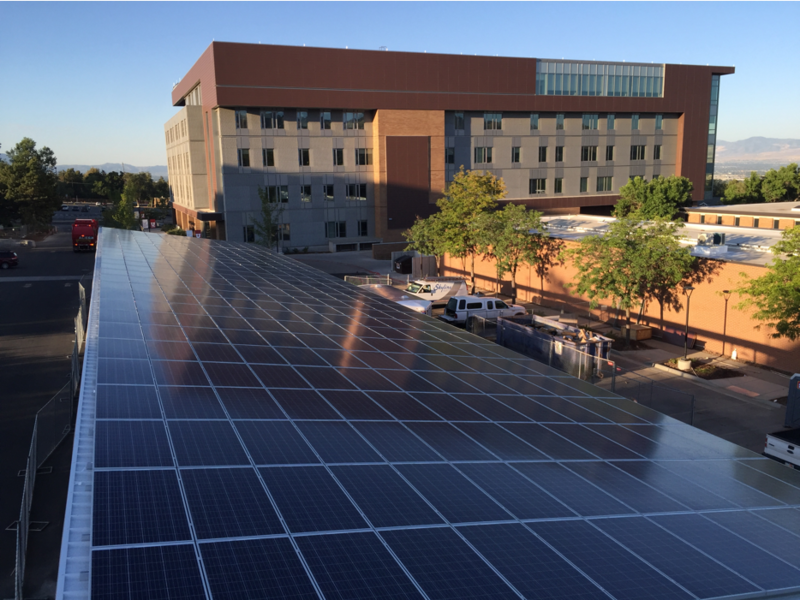 The law school was able to partner with the Sustainability Office and Commuter Services to include the solar parking structure as part of the overall sustainability initiatives that are a part of the new law school building. “We are honored to serve as a representation of incorporating sustainability features, both internal and external, into the construction of an iconic facility and hope that our building will serve as an example to other university building projects and the community at large,” said Adler. For more information about the University of Utah’s overall sustainability initiatives, visit:sustainability.utah.edu.